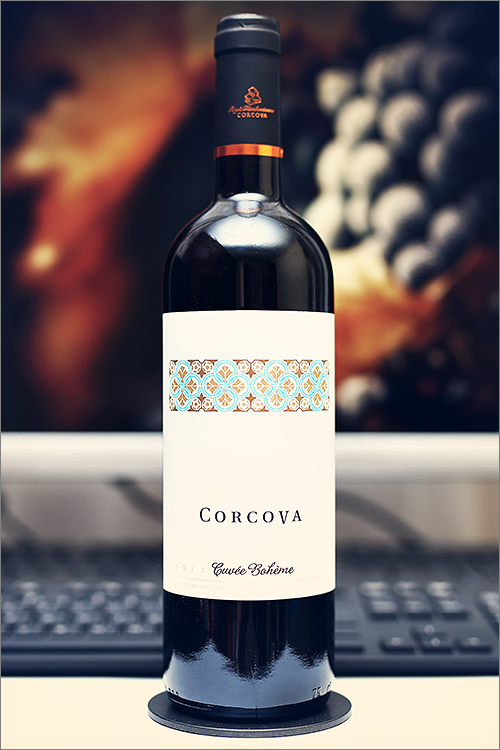 The wine we are going to review today is a blend made of syrah and merlot grape varieties from Romania – Cuvée Bohéme 2013 from Corcova. This wine is elaborated in such a manner, so that it will render as loyal as possible the local terroir eloquence of the region. Subtle human intervention in the winemaking of this wine kept untouched the flavour, the taste and the scent of the grapes. This ideology was inherited from the ancestors and is preserved as a tradition in the Mehedinti County. The name itself hints at non-conventional ideologic standards, making this wine one one of the few old-world style wines from Romania, but enough theory, let’s move on to the tasting! Dark crimson color, quite deep and opaque, with shades of indigo and purple towards the rim of the glass. The nose is strong, filled mostly with black fruits and spice: black pepper, nutmeg, smoked plum, black cherry, anise, roasted oakwood, blackcurrant, blackberry, black mulberry, charred wood, black cherry jam, black soil dust, petrichor, blackcurrant jam, tobacco, black mulberry jam, black tea, leather, smoke and some subtle hints of blood. The wine is extra-dry, with strong alcohol level, high acidity and rough tannin. It feels bold, spicy and astringent, with a nuanced old-world accent. This is a quite rough, austere and muscular wine, as it tastes firm, sharp and angular. The wine has a fair overall balance, with a touch of alcoholic warmth showing through. It has a long finish and a balanced, rough and aggressive aftertaste. This is definitely a fine Wine of Romania and the overall rating says the same, with 89.7 points scored it is right there, among the best wines we’ve tasted so far. Please click on the chart icon on the left in order to get to the wine rating page, where you can find all the wines we’ve tasted to date. Conclusion: this is a full-bodied wine blend, definitely made in an old-world style, smoky, earthy and complex, yet one that that lacks structure and refinement, as it is quite off the balance. In our view, this is a wine on decline, one that does not need any more bottle ageing, a wine that desperately requires food-pairing in order to be understood. It is quite textured, nuanced and tannic, therefore we would recommend to pair this wine with spicy, charred and fat-rich meaty dishes, like for example a grilled t-bone steak with pepper mix or a grilled skillet steak with rosemary and herb butter, as we believe that all the angularity in the wine will be perfectly complemented by the richness and spiciness of the dish. Noroc!